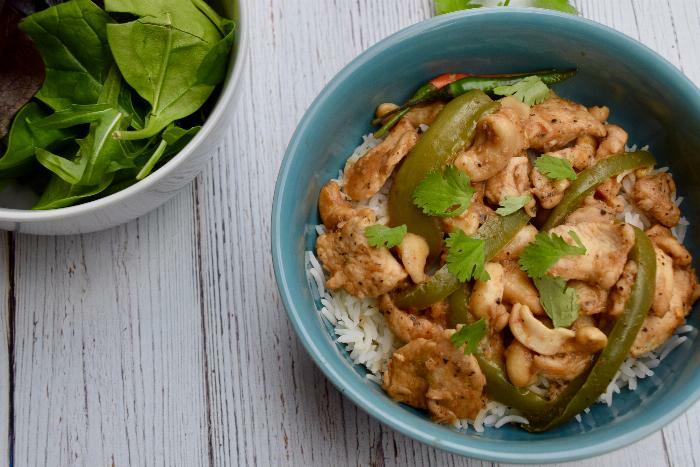 Get dinner on the table in 10-minutes with this Cashew Chicken recipe! Try this recipe for a healthy twist on your favorite Chinese inspired meal. Pair it with brown rice, white rice, steamed broccoli, or quinoa for a complete balanced meal. 1Sauce: Combine 1 tbsp sesame oil, soy sauce, ketchup, vinegar, brown sugar, honey, ginger, garlic, five spice, and red pepper flakes into a medium-size bowl. Whisk until combined and set aside for later. 2Mix 1 tbsp. corn starch, salt, and ground black pepper together in a small bowl. Place the bite size pieces of chicken into a bag or bowl and cover with cornstarch mixture. Mix the chicken around until it is fully coated. Add another tablespoon of cornstarch if needed. 3Turn the stove on to medium-high heat and add 1 tbsp. sesame oil to wok. Once the oil is heated add in the chicken and sear for 1-2 minutes. Stir the pot for consistent cooking. Pour the sauce over the chicken and cook for 3-5 minutes until all the chicken is fully cooked. Add in the bell peppers and cashews and cook for another 2 minutes. Stir frequently until fully mixed. 4Enjoy with a side of rice, brown rice, steamed broccoli, or quinoa! If you don't have low sodium soy sauce you can reduce the amount you use and if you don't have rice wine vinegar you can use apple cider vinegar.